Dr.Web Office Control, included in this license, allows users to comply with the access-control requirements of Federal Law № 152-FZ "On personal data"
For mail servers/file servers/ UNIX Internet gateways, and Linux workstations. Download, print, and fill out the application. Fill out this web form and attach a scanned copy of the application. A link to the Dr.Web eStore, where you will be able to purchase a license at a discount, will be sent to your email address. Choose a Doctor Web partner and submit your completed application to it along with a copy of your license to engage in educational activities. Because the prices set for Dr.Web bundles are already so low, you cannot apply for a renewal discount. 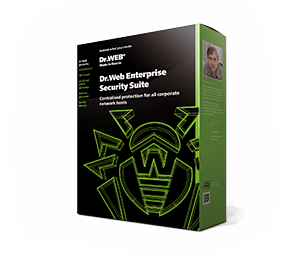 To continue using Dr.Web bundles, you will need to purchase a new license (for the same bundle or for Dr.Web Enterprise Security Suite (customer's choice)). Need to protect more objects? A 50% discount is available to educational institutions that purchase a Dr.Web Enterprise Security Suite license. Fill out the request form that gets sent to the sales support service, and attach a scanned copy of the application. Describe what Dr.Web license you need for your educational institution. A link to the Dr.Web eStore, where you will be able to purchase a license at a discount, will be sent to your email address.